Iconic Scottish brand will inscribe the names of 1843 special fathers on their new ‘Founders Wall’ in a tribute to year the distillery was opened. Glenmorangie is offering the ultimate Father’s Day gift this year with the chance for whisky lovers to create their own legacy. The iconic Scottish brand will inscribe the names of 1843 people on the ‘Founders Wall’ of the Glenmorangie Distillery in a tribute to the year of its foundation. 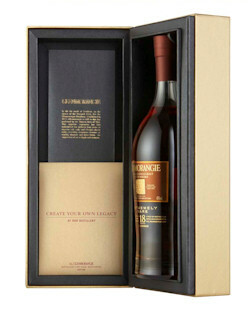 By receiving a bottle of the award-winning Glenmorangie 18 Years Old, whisky lovers can enjoy their own slice of history. The unique opportunity to make your father part of a ‘Living Legacy’ by having his name engraved on the wall of the Glenmorangie Distillery visitor centre is a timeless gift for Father’s Day. Dr Bill Lumsden, Head of Distilling and Whisky Creation at The Glenmorangie Company, said: “The ‘Living Legacy’ initiative means that whisky aficionados can become part of the Glenmorangie story. When they visit our distillery in Tain they can enjoy seeing their own name up on the Founders Wall and feel part of our proud history. This is the ultimate timeless gift for Father’s Day. Glenmorangie has carved out its reputation as a pioneer, marrying traditional techniques with innovative processes, including using Scotland’s tallest stills. The running of the Distillery is entrusted to the ‘Men of Tain’ – the skilled craftsmen charged with perfecting Glenmorangie’s spirit. Glenmorangie 18 Years Old is seen as the brand’s ‘Living Legacy’ due to its combination of heritage and modernity, and its flavour balance of maturity and vibrancy. It was recently awarded a ‘Double Gold’ medal at the 2011 San Francisco World Spirits Competition.